Thank you for following our live updates of Wednesday's special general assembly meeting and the protest by journalists at the press syndicate in Cairo. 15:40 This is the statement issued by the general assembly meeting on Wednesday. it includes a number of demands on the government, and recommendations and instructions to papers on how to push for them. 1- The dismissal of the Minister of Interior Magdy Abdel-Ghaffar from his position. 2- An official apology from the Egyptian presidency to all journalists for storming the syndicate and its siege by security forces. 3- The release all journalists jailed in publishing related cases. 4- The issuing of legislation banning the storming of the syndicate. 5- The issuing of legislation banning imprisonment penalties for publishing-related-crimes. 6- To call all Egyptian printed and online publications to post "No to the media gag order" banner and to appeal officially against the prosecution's order. 7- To call on TV channels to stop the attacks against journalists by "security orders." 8- To stop the threats against the head of the Journalists Syndicate Yehia Qallash who could face legal charges according to the Egyptian prosecution's statement. 9- To ban the publishing of the Minister of Interior's name and to publish film negatives of his photo instead of film positives. If the minister is not dismissed then the press in Egypt will stop publishing the news of the Ministry of Interior. 10- To reject recent statements from the US Department of State as well any official foreign interference in Egyptian issues. 11- To sue the Ministry of Interior for the security force’s siege of the syndicate. 12- To publish black front pages in all newspapers on Sunday. 13- To renew confidence in the syndicate's board until the crisis is over. 14- To hold a general assembly meeting on Tuesday to discuss a general strike in case that the demands of the syndicate have not been met. 15- Calling on all prominent authors to write about the crime of the storming of the syndicate. 16- To call on MPs to present requests to discuss the crisis in the House of Representatives. 17- To continue the sit-in at the syndicate until next Tuesday. 18- To form a crisis management committee comprised of members of the syndicate's board. 15:20 The urgent general assembly meeting has convened inside the syndicate to discuss possible measures of escalation. Yahia Qallash, the head of the syndicate, stated that the syndicate was holding to its demand that the minister of interior be dismissed from his position. Board member Ragy El-Marghany added that the protesters detained on 15 and 25 April should be released. Board member Karam Yehia said that President Abdel-Fattah El-Sisi was responsible for the incident at the syndicate. Yehia also demanded the cabinet issue an apology, and called on journalists to defy the media gag order imposed by the prosecution. According to Ahram Online journalists attending the assembly, journalists chanted "El-Sisi is responsible" and "break the gag order." 14:55 Emad Al-Din Hussein, the editor in chief of Al-Shorouk daily, said that many journalists were not for the blackout move, saying that newspapers come out mainly "for the public." He added in comments to CBC satellite TV channel that there has been a consensus to press on with the sit-in at the HQ until the interior minister is sacked. "All these suggestions will be discussed during the general meeting that will be attended by the protesting journalists," he added. 14:50 Mahmoud Mosallam, the editor-in-chief of the privately owned daily Al-Watan, said in TV comments that suggestions put forward during a meeting of editors-in-chief for necessary actions include attaching a black stripe to newspapers in protest or a self-imposed news blackout for a day or two. He added that others proposed that a committee of the press syndicate's board along with leading journalists be set up to meet with President Abdel-Fattah El-Sisi to contain the crisis. 14:30 The head of the Journalists Syndicate Yehia Qallash said the syndicate "knows and respects the law", insisting that the storming of the building by security forces was a crime. "We are in a crisis now, either we be or not to be," Qallash told reporters at the scene, referring to the strong stand that journalists need to make. He also added that security forces have never stormed the syndicate before in its 75-year history. 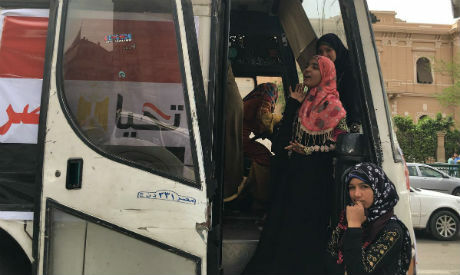 14:30 Several buses and microbuses with “Long Live Egypt” labels transferring supporters of President Abdel-Fattah El-Sisi have arrived at the scene, according to an Ahram Online reporter. 14:00 Tens of security forces are standing guard at entrances of the street where the syndicate building is located and police are only allowing syndicate members to enter after showing their ID cards at the three checkpoints, Ahram Online reporters at the scene said. Many political figures, youth activists as well as delegations from professional syndicates who sought to access the Journalists Syndicate to show solidarity were banned entry by police on Tuesday, a move that was strongly condemned. 13:45 An Ahram Online reporter says that tens of prominent journalists are attending the general assembly meeting including state-owned Akhbar Al Youm's editor-in-chief Yasser Rizq and privately owned Al Shorouk newspaper editor-in-chief Emad El-Din Hussien. 13:40 Hundreds of Egyptian journalists are protesting outside the syndicate chanting “freedom, sit in till Abdel-Ghaffar leaves, and "raise your head high you are a journalist," "End the siege,” in reference to their colleagues prevented by police check points from attending the assembly meeting for not carrying Press Syndicate identification. 13:30 Karem Mahmoud, the deputy of the syndicate, told Ahram Online that the journalists’ demand is clear -- the sacking of Interior Minister Magdy Abdel-Ghaffar -- and that they will not give up on it. However, he continued to say that it is hard to understand why the government insists stubbornly on not correcting its mistake. 13:25 Ahram Online reporter says that some journalists have decided to hold a sit-in until the Minister of Interior Magdy Abdel-Ghaffar is sacked. 13:02 Ahram Online reporter says that at least 2000 journalists are currently protesting and chanting “Bread,Freedom, Strong Union,” a play on the famous revolutionary slogan, on the stairs of the syndicate. Former Presidential candidate and founder of Popular Current , as well as journalist, Hamdeen Sabahi, has also joined the protesters. The Journalists Syndicate staircase has been considered to be a famous protest venue in Egypt since former president Hosni Mubarak’s era. 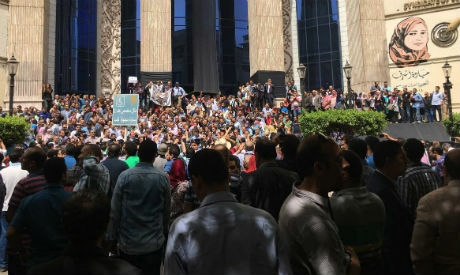 12:48 Tens of lawyers arrived at the Journalists Syndicate despite barricades on the roads leading to the building and tight security measures. The Lawyers Syndicate has already declared its full support for the Journalists Syndicate. 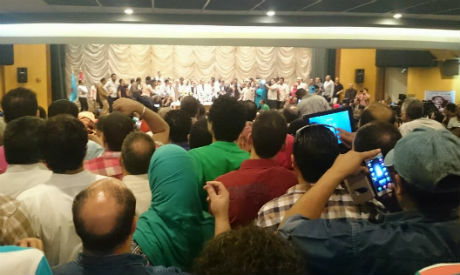 Tens of journalists who are syndicate members managed to enter the syndicate. Around 2,000 journalists gathered on Wednesday in front of the headquarters of their syndicate in downtown Cairo to defend the freedom of their union after police raided the building on Sunday to arrest two journalists who were staging a sit-in inside. The board of the syndicate described the move as "unprecedented and unconstitutional." Amr Badr and Mahmoud El-Sakka were among dozens of activists and journalists who were ordered to be arrested a few days before the 25 April protests against the recent Egyptian-Saudi Arabia Red Sea island agreement. 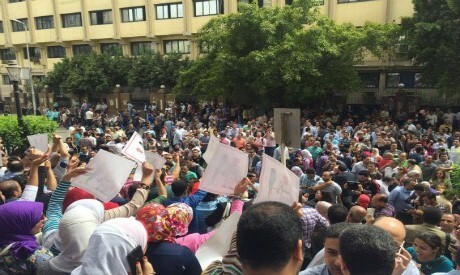 The storming of the Journalists Syndicate by security forces on Sunday caused outrage among journalists who started an open sit-in on Sunday demanding the dismissal of the interior minister. If you do not want comments from the US State Department, keep your hands out if the pickets of US taxpayers. I have never seen a country like Egypt that goes country to country with a begger's Tim cup in one hand and a mouth full of insults. Is there a country Egypt has not insulted - especially those helping Egypt? I note too that Egyptians think nothing if commenting on the external and internal affairs of the US or any other country. Want to be free of comment grow your economy and pay your own way. But that would require actual work. 1- The dismissal of the Minister of Interior from his position.